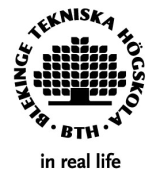 Gunilla Åkesson-Nilsson, senior lecturer at BTH, has produced this thorough instruction, in Swedish, on report writing for engineers. It can also be useful for students in other programs, since there are several general sections on basic principles of writing. It should not be used as a template for student theses. Merriam-Webster dictionary via Encyclopedia Britannica (for BTH students) and Oxford Dictionaries (free online) from Oxford University Press. Nationalencyklopedin (for BTH students) and ord.se (free online) from Norstedts both have English – Swedish / Swedish – English dictionaries. The library at BTH subscribes to a number of encyclopedias which you, as a student, can use. Here you will find both general and subject specific encyclopedias, e.g. Encyclopædia Britannica and Encyclopedia of Computer Science. At Refseek you can find a list of online encyclopedias, most of the available for free. There are several possibilities for collaborating on, and sharing documents. The Linneaus University has compiled a guide with tips on suitable online tools for sharing, storing and editing documents. In Office 365 and Google Drive there are spell checkers and several other text tools. You can also enable the spell-checking functionality directly in your browser. Via the Student portal you get access to software which can be useful when writing your paper, such as Office Online and Overleaf, a LaTeX editor. BTH students can contact the study councellors to get help with study skills.